The restorability of your data is our priority. Support for Incremental Hyper-V backups on Server 2012 up to Server 2016. Virtualization is already widely used and its use will continue to grow in the future. Microsoft is increasingly catching up with VMware and provides a comprehensive virtualization solution with Hyper-V. A growing number of our partners and customers prefer Hyper-V to VMware as they are used to the Windows Platform and get a better price performance ratio with Hyper-V compared to VMware. As Hyper-V environments continue to grow by number of hosted VM’s and amount of data, it is important to be able to only backup changes to ensure faster backups by reducing the amount of data to be backed up. With Hyper-V incremental support, that is now possible. Support for Hyper-V Clusters including Server 2016. New UI option to duplicate already created jobs to simplify configuration. New UI option to choose which transport level to use for VMware VM backup. Improved speed of file-level restore view with multiple splits and large amount of files. Improved Command Server to Agent communication for larger installations. Improvements in Single-File Restore for VMware and Hyper-V. Improvements for Windows Cluster configuration. Supports central media management for local and offsite storage. Backups and the associated media can be quickly and easily found within the central admin console. Fast, easy data recovery to new or dissimilar hardware after a loss or disaster. Supports Windows and Linux. VMs can be restored to different physical hosts. Restore backups from another site in cases of local data loss. Remove access to disk pools at another location. Restore from a media that differs from the original, such as a disk from an external replicated disk pool. Offers maximum protection from irretrievable data loss due to the loss of a backup. Offers flexible placement of storage media on the network. Distributed metadata allows restores without a central metadata database. Comprehensive features for Hyper-V and VMware (see below). Fast granular data extraction for offline SQL databases, Exchange Server mailbox stores and Outlook files. Direct access to unmounted database tables and mail store contents. Search query tools allow for specific query exports for faster restores. 3 Backups - 2 Locations - 1 Restore Path: This is the 3-2-1 Restore method used by NovaStor DataCenter. You can choose the media device that works best for your environment, with plenty of options: Disk, NAS, RDX, Tape. You can also create multiple backups and distribute them across multiple locations. You can also create multiple backups and distribute them to other locations. DataCenter centralizes access to all backup and replications at all locations, thus reducing the complexities of data restores. Keep your backups organized and retain complete control. Spinning up a new virtual machine can be done rather quickly. But can you recover your virtual environment after a failure just as fast? With version 6.0 of NovaStor DataCenter, the following functions are supported to improve virtual machine backup and recovery. Maximum flexibility for single file restore for Hyper-V and VMware. Split screen for image and target for simultaneous viewing. Restore files from VMware or Hyper-V backups on a different NovaStor DataCenter client. Transparent support of VMware datastores allows for the selection of a target datastore when restoring. Replicate virtual machines for high-availability of time-critical systems. Configure version history to easily roll-back to the appropriate version for recovery. 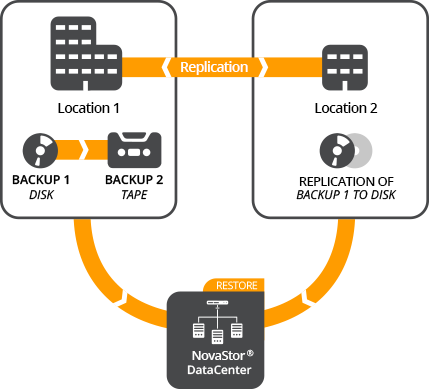 How NovaStor DataCenter 6 solves your backup and restore problems? Granular Restore for SQL and Exchange offers fast, pinpointed restores. A new Backup Server optimizes images and accelerates VMware and Hyper-V restores. Multistreaming for unlimited, accelerated backup and restore. Parallel execution of an unlimited number of backup jobs: physical and virtual machines. High-performance data mover with optimized compression methods distribute the computational load on client and storage medium. Minimal effort for the control of data backups through centralized monitoring. Unique backup architecture with distributed metadata for highest stability. Automation of all processes, no manual intervention necessary. Fault tolerance, for example, by failover media pools. Remote installation of clients on Windows machines directly from the GUI. Centralized management of network-wide backups from a single pane of glass. Single File Restore and full backups of physical systems and VMware & Hyper-V virtual machines. Free choice of manufacturer for Storage and type (disk, tape, cloud, etc.). Backup and restore remotely to storage at another location. Support for current / future standards such as Exchange 2016 & SQL 2016 and Hyper-V 2016. Unlimited scalability from 4 to thousands servers. System requirements and additional functions can be found on the website for NovaStor DataCenter. Central media management for tiered backup. Storage media can be used for flexible restores. Backup server accelerates VMware restores. Granular restore for pinpointed data extraction. In-house support — never outsourced. Proven in SMEs, public institutions and data centers. Distributed architecture for increased stability. Fault tolerance achieved with failover media pools. Support for the latest standard technologies (for example, Exchange 2016, SQL 2016 Hyper-V 2016). Assign user rights for faster NAS storage setup. Automated storage management on many levels. Top performance on even low-cost storage hardware. Highest backup speeds with Multistreaming. For a full list of NovaStor DataCenter features and benefits visit the website for NovaStor DataCenter. Download our NovaStor DataCenter 6 data sheet to get a full list of features and technical information. NovaStor provides fast, easy and uncomplicated entry into the central network backup with NovaStor DataCenter. Our team of experienced support engineers can assist with installation and setup of the software and provide quick response to technical problems. With NovaStor's Setup Assistant we assume the expense and risk of the installation and setup of NovaStor DataCenter. Our backup engineers install the software and set up the first backup so everything is setup and properly configured from day one. You can use NovaStor DataCenter universally for backup of Windows and Linux systems, Hyper-V and VMware (Licensed w/vStorage API) environments. Common databases and applications are protected with platform-neutral and vendor-independent backups. All you need is one license per server, physical host or backup server. To ensure that your transition to NovaStor is smooth and your future with us is secure, we provide on-going support. We never want you to feel alone. For technical questions or in critical situations such as a system failure, our support engineers provide expert help via phone, email or remote access directly from our US office. © 2019 NovaStor. All Rights Reserved.